Storm Collectibles presents the limited edition Player 2 alternate blue color Ryu 1:12 scale action figure from Street Fighter V, featuring 1:6 scale quality in 1:12 scale! Ryu boasts his signature white karate gi with torn sleeves, medium length hair, long red headband, red gloves, black martial arts belt, and bare feet. He stands about 7-inches tall, with over 30 points of articulation that give Ryu the ability to pose for his special moves: Hadoken, Shoryuken, and Tatsumaki Senpukyaku! 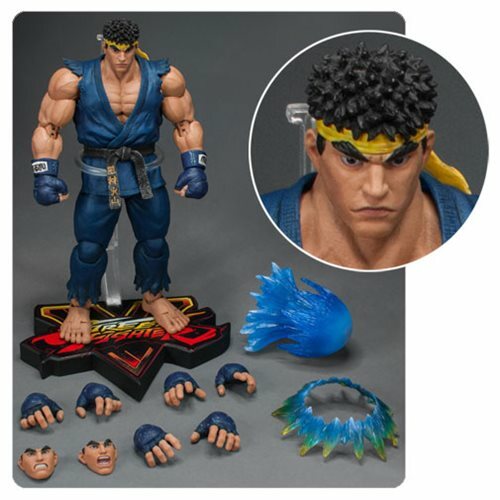 The Street Fighter V Special Edition Blue Version Ryu 1:12 Scale Action Figure includes a Hadoken effect part, 3 exchangeable facial expressions, and 4 exchangeable palms. Ages 17 and up. Storm Collectibles is honored to work with Capcom to produce this high-quality 1:12 scale action figure for the popular combat game Street Fighter V. Ryu is the main character of the fighting game series and appears in every SF game. Without a doubt, Ryu is one of the most iconic characters in the fighting game genre.